6 rows in patt = 7.5 x 9" (19 x 23 cm) including "lobes"
7.5 x 86" (19 x 218 cm) rectangle incl. "lobes". Pattern is adjustable. 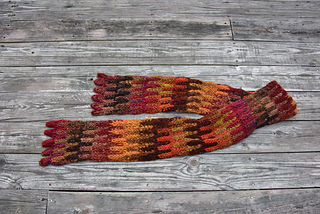 This pattern is also available as part of the Simple Stacks Collection at a 38% discount. This set of five fun stacked stitch projects that each teach a different aspect of the technique. 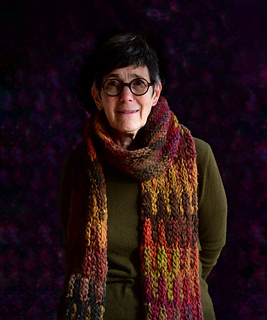 This scarf is the best place to start if you are new to the stacked stitch technique. 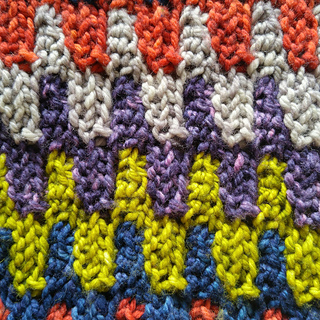 There are no ends to weave in because it is worked in self striping yarn. It has many markers to guide you through each row and the pattern is very forgiving of mistakes.This is the project I use for my intro to stacked stitches classes. 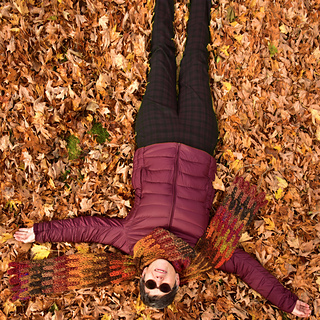 If you have your eye on a complex pattern like Fox Paws, Turkish Wave, or the Lotus Challenge Shawl but want to start with something less daunting, this is the project for you. I’ve made my scarf very long and narrow. It reminds me of the skinny scarves in the Missoni F/W 16 collection. This is a favorite accessory when paired with some 70s style clothes and mustard colored platforms, it just makes me feel tall and fashionable. If you aren’t into the long skinny scarf or want to use a thinner yarn, there are instructions to change the width in the pattern. 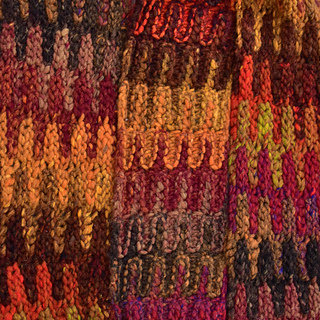 There are also helpful tips and a note on how to work this scarf in a solid colored yarn. If you can get through this scarf, you’ll be ready to take on even the hardest of stacked stitch patterns. Finished Size: 7.5 x 86” (19 x 218 cm) rectangle incl. “lobes”. Yarn: 3 skeins Noro Kureyon Air, 109 yards (100m) per 100g. Shown in color 263. Needles: Size 15 (10mm) 24” circular needles or size needed to obtain gauge. Other Materials: 5 stitch markers, Tapestry needle.